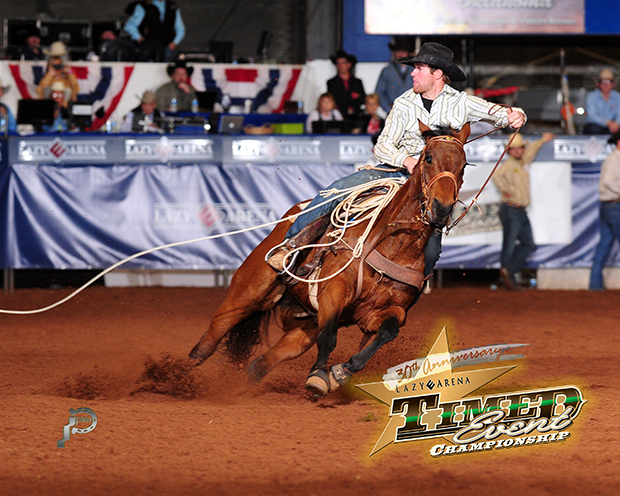 GUTHRIE, Okla. – There’s a changing of the guard at the Timed Event Championship of the World. Paul David Tierney, a 24-year-old cowboy from Oral, S.D., roped, tied and wrestled 25 animals in 332.3 seconds to win his first gold buckle, the fifth Timed Event title for his family. His father, Paul, earned four championships over nearly three decades of competition. The younger Tierney is still playing inside the Lazy E Arena, but he’s doing it in the arena instead of behind the scenes. It came down the final steer of the competition to decide the championship of the “Ironman of ProRodeo.” Tierney, who had led since the third round, relinquished his advantage in the 24th run of this rugged test when he posted an 18.9-second steer wrestling run, just moments after his nearest competitor, 22-year-old Clay Smith, had scored a 5.7. Smith took a 1.8-second lead into steer roping. When Tierney finished in 20.2 seconds, the championship was well within reach for the youngest competitor in this year’s field. Smith, though, broke the barrier on a 13.6-second run; that 10-second penalty pushed his time to 23.6 and pushed him to second place, finishing in a cumulative time of 333.9 seconds. It overshadowed an amazing performance by the top young guns in the competition. With past champions K.C. Jones of Burlington, Wyo., and Daniel Green of Oakdale, Calif., among the top five, the top three cowboys all were relative newcomers to this unique contest: third-place finisher Russell Cardoza of Terrebonne, Ore., is just 27 years old. That’s the key to the Timed Event. The winner each year typically is the contestant who made the fewest mistakes through the five rounds of competition. By finishing second, Smith pocketed $25,000. Cardoza added $24,000 – $15,000 for his third-place finish, $5,000 and $4,000 for finishing third and fourth in the fastest rounds. Not only are Tierney, Smith and Cardoza the future of the competition, they bring an educated approach to their games. He becomes just the 12th man in the 30-year history of the Timed Event Championship to own the prestigious gold buckle. His name will be etched alongside his father and the other 10 winners in rodeo lore. AVERAGE: 1. Paul David Tierney, 332.3 seconds, $50,000; 2. Clay Smith, 333.9, $25,000; 3. Russell Cardoza, 344.2, $15,000; 4. K.C. Jones, 350.9, $10,000; 5. Daniel Green, 390.9, $7,500; 6. Clayton Hass, 404.7, $5,000; 7, Dustin Bird, 408.8, $4,500; 8. Landon McClaugherty, 425.4, $3,000. FASTEST ROUND LEADERS: 1. Paul David Tierney, 49.0, $10,000; 2. Erich Rogers, 52.5. $6,000; 3. Russell Cardoza, 54.6, $5,000; 4. Russell Cardoza, 55.9, $4,000; 5. K.C. Jones, 56.7, $3,000; 6. Trell Etbauer, 56.8, $2,000. RECORD RUN: Spencer Mitchell, 4.3 seconds in heading, $3,000. TOTAL PAYOUT: 1. Paul David Tierney, $60,000; 2. Clay Smith, $25,000; 3. Russell Cardoza, $24,000; 4. K.C. Jones, $13,000; 5. Daniel Green, $7,500; 6. Erich Rogers, $6,000; 7. Clayton Hass, $5,000; 8. Dustin Bird, $4,500; 9. (tie) Landon McClaugherty and Spencer Mitchell, $3,000; 11. Trell Etbauer, $2,000.